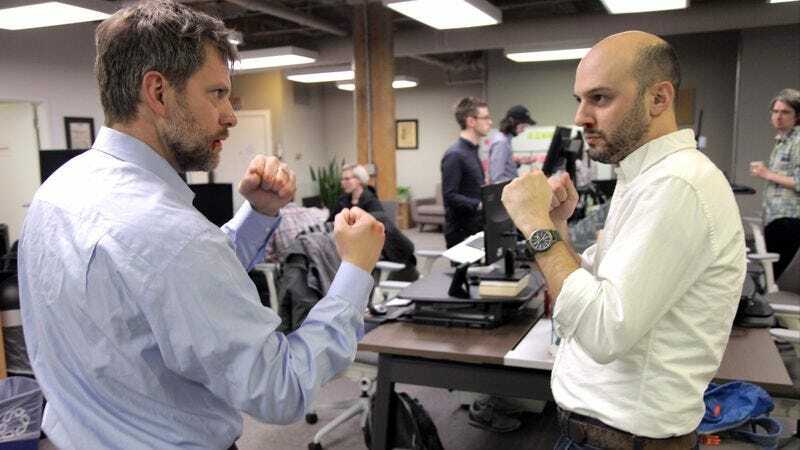 CHAMPAIGN, IL—Researchers from the University of Illinois released a new study of occupational hazards Wednesday revealing that 90 percent of workplace injuries in the United States are caused by bare-knuckle boxing. “According to our data, roughly nine of every 10 injuries that occur on the job stem from incidents in which two employees stand up from their desks, roll up their sleeves, clench their raised hands in fists, and then circle each other before unleashing a barrage of gloveless blows,” said lead researcher Carol Skelton, adding that, while fisticuffs-related bruises, cuts, and bone fractures most often occur in large, open areas like lobbies and conference rooms, it was not uncommon for impromptu slugfests to break out in kitchenettes, server rooms, or between rows of cubicles. “Additionally, we found that the most severe instances of bodily harm in offices typically transpire when one worker has another pinned up against a whiteboard or printing station and is pummeling them with a brutal combination of vicious jabs and hooks. While employers can’t eliminate all workplace injuries, they can take common-sense measures to reduce them by strictly limiting rounds to three minutes each.” The study also found that nearly 100 hours of productivity are lost each year to employees crowding around pairs of sparring coworkers and shouting bets.